How is Kids Yoga Monthly different than the Kids Yoga Stories blog and newsletter? Kids Yoga Monthly is a paid subscription service where you’ll receive four digital yoga products each month. All four products will relate to a new theme each month, all chosen to help save you time planning yoga lessons and activities. Paid subscribers also have access to a private community, where they can share support, find resources, and more. Our weekly Kids Yoga Stories newsletter is free. Newsletter subscribers receive updates about what’s going on at Kids Yoga Stories. This includes things like information about new releases and new products from Kids Yoga Stories and yoga tips and ideas from me. You’ll still receive the newsletter if you’re signed up for that too. How are the products delivered? Will I be receiving anything in the mail? This is a digital-only program, so you won’t be receiving anything in the mail. You will receive an email at the beginning of the month with four digital links, where you can download the products. What ages are the yoga resources suitable for? The yoga books and yoga cards in our Kids Yoga Monthly program target children ages 2-8 years old. However, our yoga resources can be adapted for various ages and developmental needs. Our yoga products are designed to act as springboards to other learning experiences suitable for any age. Will I need a printer to access my digital products? A printer is not necessary. You can view the products on any device and use them as many times as you want. You can, however, also print them out if you prefer—but you will need to download the product first before printing. Find printing instructions for our digital products here. Are there any yoga videos included? No, our Kids Yoga Monthly products are literacy-based, and we do not create videos for children at this time. However, we’ll be including some audiobook videos of our yoga books to include in your independent-reading corners. A sample audiobook of Rachel’s Day in the Garden is here. I do have videos targeting adults hoping to teach yoga to kids—and that is the sort of information newsletter subscribers would receive updates about—but those videos are not part of the Kids Yoga Monthly products. What does the digital Kids Yoga Monthly include? Though the specific combination of goodies might change, you will receive four digital items based on a single theme each month. Will I have to log in access to the resources? No. The content comes directly to your email account. The content links in the emails do not expire. So as long as you have not deleted past emails, you will always have access to past content. Many subscribers archive the emails and use their email account’s search feature to find older emails whenever they need them. I do highly recommend that you download the items you want to keep as soon as you receive the email with the links. I further recommend keeping a folder on your hard drive or in the cloud where you can reference these at your leisure. Though you do not need to log in to access the digital materials, you will need to create an account and log in to update your profile and payment details as necessary. What level of yoga experience do I have to have to sign up? The Kids Yoga Monthly is for beginners to advanced practitioners of yoga. Each month, you’ll receive a yoga challenge to deepen your own practice, no matter how much previous experience you have with yoga. Our yoga books naturally take children through the yoga poses as they read along and act out the stories. So no experience is necessary to join. What are some sample yoga themes? We incorporate educational, environmental, and global themes into our yoga products. Sample monthly themes are feelings, jungle, fall, garden, and love. Generally speaking, what are the benefits of yoga for kids? Where do I locate my monthly subscription? 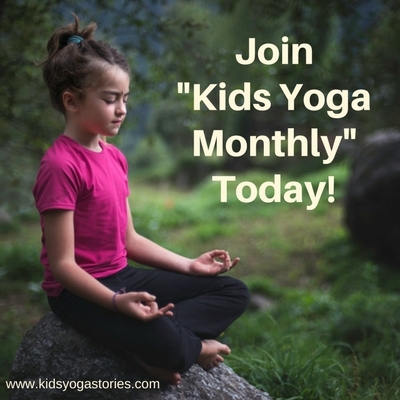 Kids Yoga Monthly is delivered directly into your inbox at the beginning of each month. The content comes directly to your email account. The content links in the emails do not expire. So as long as you have not deleted past emails, you will always have access to past content. Many subscribers archive the emails and use their email account’s search feature to find older emails whenever they need them. When do I get my first subscription? Kids Yoga Monthly is sent out the first day of each month (1st). When will I get charged for my monthly subscription? You will be automatically charged on the same day each month that you originally signed up for Kids Yoga Monthly. But your monthly email will always land in your inbox on the 1st of the month. For example, if you sign up on January 25th, you will always be charged on the 25th of each month. Then you’ll receive your monthly email on the 1st of the next month (in this example, February 1st). What do I receive each month? Each month you will receive one email with four goodies on a specific topic. Please note that you have full control over your subscription and can make nearly all changes desired within your account via the Account page. You can login to your Kids Yoga Monthly Account page at any time to update your profile (ex. name and address) or payment details. Simply sign in to your Kids Yoga Monthly account, click on “Subscriptions,” and then hit “Update” to change your credit card details. Please note: Email me directly if you change your email address. This will affect the monthly delivery if we are not notified directly of an email change. I recommend first downloading any materials that you intend to print. Then you can find instructions for printing our digital products here. Where is the private Kids Yoga Monthly Community? The Kids Yoga Monthly Community is a private Facebook group for paid members only. This is where you can go to connect with other teachers and parents who love teaching yoga to kids. I’ll also provide additional ideas, resources, and support there. Our Facebook community is wonderfully supportive. You’ll find the link to the Facebook group in your Kids Yoga Monthly emails, or email me directly. I’ve tried it out, but I don’t think Kids Yoga Monthly is for me. What’s your refund policy? We strive to provide you with engaging and enjoyable educational products each and every month. However, we understand when sometimes a product or service just isn’t the right fit. You can cancel your subscription at any time, however I cannot provide refunds or partial refunds on what has already been electronically delivered and received. I haven’t received any emails for weeks (or months). What’s going on? Sometimes our emails get caught in your spam filters. So please check your spam folder right away. We have no way of knowing on our end when this happens. If you haven’t received an email from us, please reach out as soon as possible, and we’ll help you figure out how to get you back on track. Please note that if you unsubscribed from the free Kids Yoga Stories newsletter, you will automatically be unsubscribed from the Kids Yoga Monthly emails. You’ll still get charged the monthly fee, however. Please contact me directly if you’d like to unsubscribe from the free Kids Yoga Stories newsletter so that your Kids Yoga Monthly is not affected. I might have accidentally unsubscribed because I haven’t seen my monthly subscription. Can I be refunded for all the months I didn’t get the emails? Even though we don’t provide refunds, once your email address is reestablished, we are happy to provide you with the content for the months that you missed. b) Notify us with an email address change or to unsubscribe from our general list so as not to disrupt receiving your digital monthly product. What’s your general refund policy? We strive to always provide quality service and products. If for whatever reason you are not satisfied with Kids Yoga Monthly or you no longer want to maintain your subscription, you can cancel at any time. We understand that sometimes you miss an email or forget about a recurring subscription and you find yourself a few months behind. We’ve all been there. However, because this is a digital product, we do not provide full, partial, or prorated refunds for products sent and/or received through Kids Yoga Monthly. You will not be charged for any following months. The commitment is completely up to you. We hope you enjoy many months (and years!) of Kids Yoga Monthly, but if for some reason, you don’t enjoy it, you can cancel at any time—even right after the first month. Can I upload and share this resource with my fellow teachers? No. Please don’t upload the resources to a personal, classroom, or studio website—this action is in violation of the Digital Millennium Copyright Act (DMCA). However, we can make special arrangements if your school or studio would like to share a subscription among multiple teachers or team members. Please see the next question. Can I purchase multiple licenses for my staff/team? If you’d like to buy multiple licenses for your school or studio, please reach out directly for special rates and arrangements. I’m happy to accommodate. Can I buy an annual membership? Kids Yoga Monthly can also be Kids Yoga Yearly! We even offer a discount for purchasing an annual subscription. Similar to Kids Yoga Monthly, we only open the subscription to new members a few times a year. Sign up for the waitlist here. Please note: There are no refunds on the annual subscription. Also you cannot get the entire year delivered ahead of time. You will continue to receive the digital content monthly but at a reduced rate.